Getting around Workflow is easy to do, but sometimes we forget the basics. This guide will help you get to grips with your Dashboard, the main Workflow Editor screen, and the buttons and functions inside Workflow. Once you are signed in to your Single Sign On (SSO), select your Workflow instance. Once you are in your instance you will see the above dashboard. This is where you can create and edit Workflows, see your Workflow history, sort your Workflows into folders, and see what stage your Workflows are in. 1. Your current instance name is displayed here. Clicking the drop down arrow will allow you to access your Instance Settings, User Settings and the ability to Log Out. 2. The Help icon will take you to the CommuniGator Help Site. 3. The statement in blue lets you know how many Workflows you have licensed. Once you have reached your license limit, please contact your Account Manager to discuss extending your limit. 4. The Workflow states are displayed here. Your Workflow can be Live, in Test, in Design, Complete, or Queued. The number of Workflows in each state are displayed. 5. Here you can Create a Workflow, Copy a Workflow, or Copy from a Template. 6. Checking this tick box allows you to filter by folder. A blue folder icon will appear next to the checkbox displaying your folder options. This is useful if you know which folder a Workflow could be in. You are also presented with the option to create and move folders. 7. Type the name of the Workflow you are searching for in this search bar. 8. The names of your Workflows are displayed here. 9. The date your Workflow is created is displayed here. 10. This shows the state your Workflow is in. Blue is Designed, Green is Live, and Orange is Test. 11. Here you can select the drop down to analyse your results or delete the workflow. 12. This displays the number of pages in your Dashboard. You can also refresh the current page by selecting the arrow icon. The Workflow design page starts as a blank grey canvas. Onto this you would drag stages to send people through your Workflow. When designing your Workflow we recommend you keep the canvas neat, with arrows visible and blocks evenly spaced. This prevents the page from being cluttered and hard to navigate. 1. The name of your Workflow and its current state is displayed here. Currently this Workflow is called "TTest" and is in the "Design" stage. 2. Workflow settings are shown here. This will be explained in the next section of this article. 3. These are your Workflow Stages. They all contain blocks which pertain to the stage name. 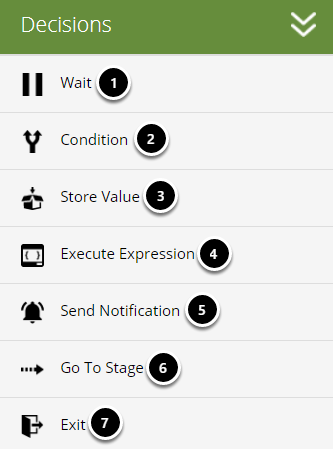 For example, the Audience Stage contains a Group Entry block which allows you to start your Workflow with a Group. 4. This is the design canvas. Here you place blocks to navigate people through a Workflow. The design canvas is a large working space, enabling you to create complicated Workflows if you wish. 1. The magnifying icons allow you to zoom in and out of the Workflow. You can also do this by using your middle mouse button. 2. This allows you to edit the basic settings of the Workflow. You can change the name, add notes for your benefit, add multiple test email addresses, de-dupe audience members using email, remove unsent emails if a member is removed from the Workflow, and change the Start & End Date and Time. 3. This allows you to Save the Workflow. We recommend saving your work often as there is no auto-save in place. 4. You can change your Workflow state here to Live, Design, or Test. 5. Clicking this icon selects all the Workflow stages at once. 6. The bin icon allows you to delete selected or multiple stages. 7. This ion will reset the entire canvas. 1. 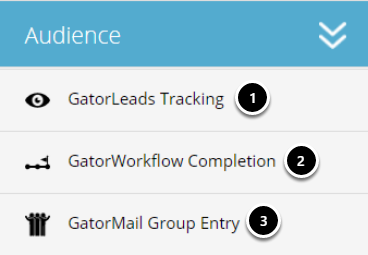 GatorLeads Tracking - This block adds members into the Workflow based on their Leads activity for your website pages. 2. GatorWorkflow Completion - This block allows you to add members into the Workflow based on them completing another Workflow you have created. 3. GatorMail Group Entry - This block allows you to place members into the Workflow from a group you have created. 1. 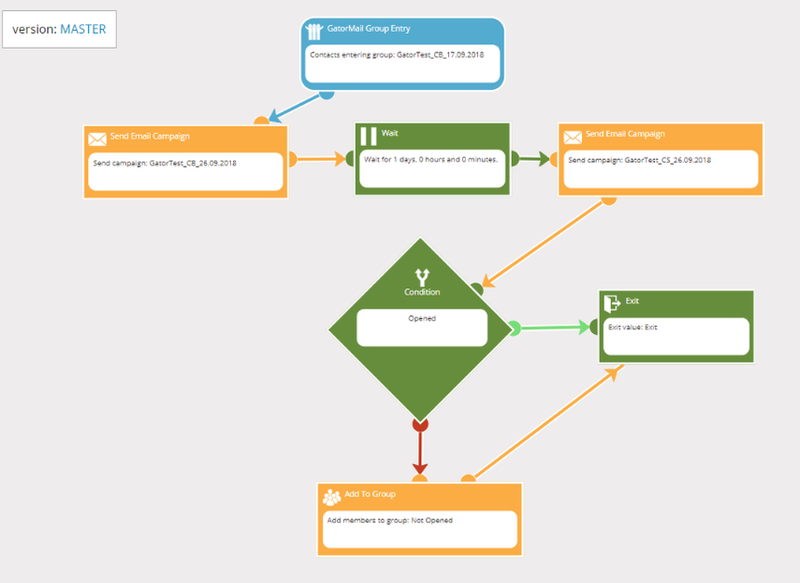 Send Email Campaign - This block allows you to attach an email campaign to send to members of the Workflow. 2. 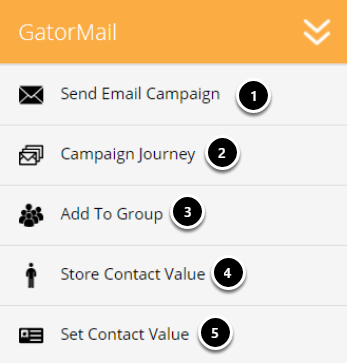 Campaign Journey - This sends members a set of GatorMail campaigns (one campaign each time they enter the stage). 3. Add to Group - This entry stage allows you to add in a Group which become the members of your Workflow. You can add in multiple groups to a Workflow. 4. Store Contact Value - This retrieves an attribute value from a members contact record and stores it in a named location for later use in the Workflow. 5. Set Contact Value - This allows you to set a value in a members contact record. For example, you could be registering interest for sports events through an email campaign in Workflow. You may have three links to sports events in your email such as football, rugby and badminton. If one member clicks on football you may send them a football focused email. You could use the set contact value block to register football as the value in the Interest field in their contact record. 1. Wait - This blocks allows you to add a wait period. This is used to stagger sending of emails to members. 2. Condition - This block allows you to add a condition. This is used after an email send block. When a member is sent an email campaign you can change how they move through the Workflow by setting a rule on the condition block. For example, if a member opens the email campaign they are sent along the green route to exit the Workflow, but if they do not open the email they wait a day before being sent a follow up email. 3. Store Value - This stores an attribute value into a named location for use later in the Workflow. 4. Execute Expression - This executes an expression you create and stores the result of said expression in a named location associated with a Workflow member. This can be used for multiple functions. For example, to combine GatorLeads scores for certain pages and provide an overall value. 5. Send Notification - This blocks allows you to send a notification to email addresses when a member has entered or exited a stage, met a condition, etc. 6. Go To Stage - This blocks allows you to send a specific member to a certain stage in your Workflow. 7. Exit - This block allows you to create an Exit stage for the Workflow. Please Note: Every Workflow requires at least one Audience entry point and at least one exit point. Here is an example of a Workflow design. It starts with a Group Entry who become the Workflow members, which are sent an email campaign. They then wait for a day and are sent a different email campaign. If they open the email they exit the Workflow, but if they don't open the email they are added to a "Not Opened" group then exit. Group Enters -> Sent Email Campaign 1 -> Wait for a day -> Sent Email Campaign 2 -> "If they OPEN the email they EXIT" -> "If they DON'T OPEN the email they ENTER GROUP" -> Exit.